Much has been written about the beautiful tango “Gricel”. 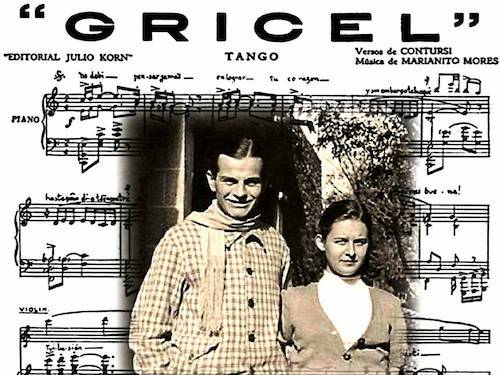 Here we reference “Gricel, una Historia Romantica” and “La Historia de Amor que Se Eternizó en un Tango” (in spanish). To begin the story we ask, what do the following tangos have in common? First we can say that we commonly dance to some of these at our milongas, and secondly that the lyrics were all written by José Maria Contursi. José Maria Contursi met the beautiful Gricel when she was only 15 years old, but apparently it was love at first sight. Despite the fact that he was married, the two of them engaged in a brief romantic relationship. At some point Contursi realized that he could not leave his family, and the relationship ended. Later Gricel married and moved away from Buenos Aires. For decades Contursi pined over his beloved Gricel, and it is said that those songs listed here were a manifestation of his longing for her (it is even told that he confessed to this fact). Some 22 years later, Contursi’s wife passed away and he became a drunkard and Gricel’s husband had abandoned her. At some point the renowned bandoneonist Ciriaco Ortiz found Gricel and informed her that José Maria was alone, depressed, and drinking heavily. She returned to Buenos Aires and the two reunited. They were wed in 1967, some thirty two years after they had first met. They remained husband and wife until Contursi died in 1972.
can know that the wish was ultimately fulfilled. A picture of José Maria and Gricel during their brief affair is displayed at the top of this post.